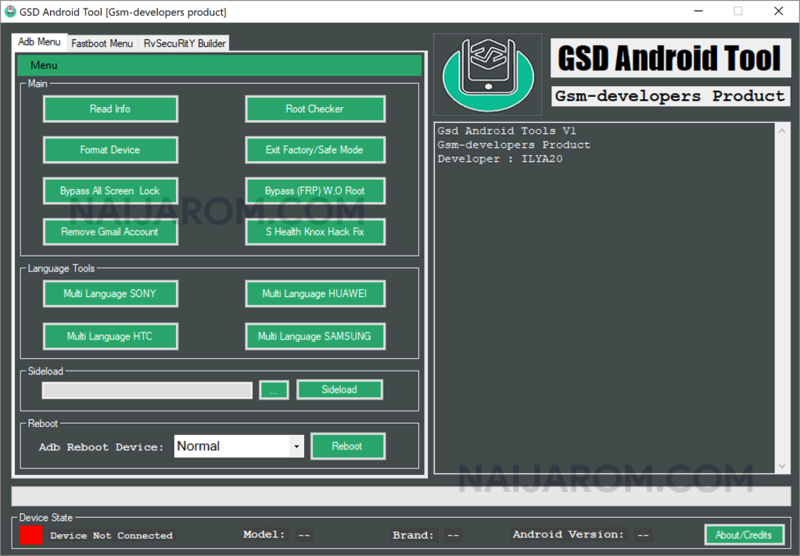 GSD Android Tool v1.0.0 is a small application for windows computer which allows you to read the Mobile Device information, Format the Device, Bypass the Screen Lock, Remove the Google Account, Checking the Root status of the device, Exit Factory of Safe Mode. It also allows you to Bypass the FRP Protection without the Root Access, Checking the Samsung Health Knox, Multi Language for Sony Xperia Device, Multi Language for Huawei Devices, Multi Language for HTC Devices, Multi Language for Samsung Devices. It also allows you to sideload any file on your Android Smartphone and tablets, Reboot the Android Device into fastboot mode, Recovery Mode or Normal Mode. [*] Credits: GSD Android Tool v1.0.0 is created and distributed by Ilya20 (developer). So, full credits goes to Ilya20 (developer) for sharing the tool for free.